We’re big fans of food with an anise-like flavor, such as fennel and tarragon. This recipe for Israeli Couscous with Peas and Tarragon has a subtle anise flavor that nicely complements the couscous and the peas. It’s a quick and easy side dish that goes particularly well with fish or chicken. Israeli couscous is a pasta, made from durum wheat semolina, which is rolled into balls, similar to its tinier cousin couscous. However, Israeli couscous is toasted, which gives it an appealing nutty flavor and is prepared in boiling water. You can prepare it using the pasta method or using the risotto method as I do here: bring the couscous to a boil in a measured amount of seasoned water or stock, stir frequently until all the liquid is absorbed and the couscous is tender, but not mushy. Once the cooking is done, the dish is table ready. Stir in the couscous and scallions and sauté, stirring frequently for 2 minutes; the lightly toasted aroma of the wheat should be apparent. Add water, salt, and pepper and bring to a boil. Lower the heat to a gentle boil and continue cooking for 12 minutes; the couscous is done when the water is completely absorbed and the couscous is tender, but not mushy. Add the peas, stir, and cook until the peas are heated through. Finish off by stirring in the tarragon and serve immediately. Use the risotto method to make this quick and easy Israeli Couscous with Peas and Tarragon by cooking in a measured amount of liquid with the aromatics. A great side for chicken and fish. Roasted acorn squash makes a delicious side dish. For this recipe I served this with a pan-roasted pork tenderloin, seasoned solely with salt and pepper, seared in a skillet and finished in the oven to 145 degrees F. A slightly pink interior. Try our Rosemary Honey-Mustard sauce over the pork, it’s perfect for this dish. I chose to leave the skin on for a different presentation. I’ve been told the skin is edible, but I find it to be tough, especially when roasted, it gets a little firmer. But, the skin on add a beautiful presentation to any dish and the sweet pulp is easily scrapped off with a fork. This recipe is easily adaptable to any number of people. And, the squash can be cut in half or in quarters in lieu of slices. Add a few more minutes of cooking time. The squash is done when fork tender. One-half acorn squash is usually a perfect serving, unless you have many other sides, then figure ¼ squash per person. This recipe is a great example of using both dried and fresh herbs. The dried thyme is best when roasting – the flavor permeates the squash but doesn’t burn and there are no fussy twigs to get rid of. The fresh thyme is the perfect garnish; it brings a pure, fresh taste of the thyme to the dish, as well as a lovely contrasting color. Preheat the oven to 425 degrees F. Line a Line a 13 by-18-by-1-inch baking sheet with parchment paper or foil. Scrub the outside of the squash with a vegetable brush and dry. Scoop out the seeds and discard. The acorn squash is ready to be seasoned and roasted in this form, or cut in half again for quarters, or cut each quarter into 2 or 3 more slices. The squash is very adaptable to cooking in any format. If cooking the squash in half or quarters, trim a small piece off a center rib so the squash sits flat when place skin side down. Combine the salt, dried thyme and pepper in a small bowl. Brush the inside and outside of the squash with the oil. Sprinkle the squash with the spice mix. Place the half or quartered acorn squash skin side down or strew the slices of squash across the baking sheet and roast for 30 minutes in the preheated oven, or until the squash is very soft when pierced with a fork. Garnish with the fresh thyme and use the sprigs to garnish the serving platter. This recipe is easily adaptable to any number of people. One-half acorn squash is usually a perfect serving for one, unless you have many other sides, then figure ¼ squash per person. This recipe is loosely based on my mother’s Thanksgiving Stuffing recipe from my childhood. In those days we put the stuffing inside the turkey and it absorbed those delicious turkey juices. Unfortunately, that is no longer recommended for food safety reasons. The center of the stuffing needs to reach an internal temperature of 165 degrees F to render any bacteria from the drippings harmless. By the time the dressing reaches that temperature, the turkey is overdone and very dry. Recently I was approached by More Than Gourmet to enter a contest they were running to create a recipe video using their Classic Roasted Turkey Demi-glace. Right away it occurred to me to add the demi-glace to my Thanksgiving Stuffing recipe. What a great way to replicate that delicious turkey flavor. You can watch and vote for my video here! A little background, a demi-glace is a stock that has been reduced to a gelatin-like consistency. It’s used in small amounts and reconstituted with water. A little goes a long way in providing flavor. I love to use them in making quick pan sauces. Mom’s stuffing started with sautéed diced onion, celery, and apple. I start that way, and boy those aromas are one of my fondest food memories. She used one kind of bread. I like to use three: whole grain, pumpernickel, and an unseeded rye. Don’t fret about buying three loaves of bread, go to your local deli and ask them for the slices! The different flavors of each bread add complexity to the dish. I don’t recall Mom using herbs, but I love dried sage, a spice I acquaint with both turkey and Thanksgiving. I also like a little dried fruit in the stuffing and usually add raisins, but dried cranberries are good, too. Milk and eggs bind the whole thing together. Quick tip: To dice an apple, peel, quarter, core, and slice each quarter into thin slices. Then cut the slices into thin sticks. Turn and cut the sticks into a small dice. To start, melt the butter in medium saucepan that has a cover over medium heat. Add the onions, celery, apple, sage, salt and pepper; stir, cover, and sweat for 6 minutes, stirring once. If the vegetables start to brown, lower the heat a bit. Add the demi-glace and 1 cup plus 2 tablespoons cold water, bring to a boil, lower to a good simmer, and cook until the demi-glace is dissolved. Take off the heat, add the raisins, and let cool. Preheat oven to 350 degrees F and lightly grease a 2-quart casserole dish. Crack the eggs into a large mixing bowl, add the milk, and beat until frothy. Cut the bread into roughly 1/2-inch cubes. Stir in the cooled vegetables. Fold in the bread cubes mixing until everything is moist. Pour mixture into a lightly greased casserole. The stuffing can be made up to this point, covered, and refrigerated up to one day before baking. Let sit on the counter for an hour to warm up before putting in there oven. Cover the casserole dish with a lid or aluminum foil snuggly fitted around the dish and bake in the preheated oven for 40 minutes or until the internal temperature reaches 165 degrees F. Remove the cover and cook for another 15-20 minutes to crisp the top. To dice an apple, peel, quarter, core, and slice each quarter into thin slices. Then cut the slices into thin sticks. Turn and cut the sticks into a small dice. Here’s a little twist on traditional applesauce, Apple-Pear Sauce. Fall is upon us and apples and pears are in season and in abundance. To create a complex flavor and varying textures I like to use three varieties of pears and apples. I used Bartlett and Starkrimson, which are sweet and juicy pears with a softer pulp, and Bosc, which is less sweet and firm in texture. The apples, which I sourced from The Whittier Fruit Farm during my recent trip to Rochester, included SweeTango, crisp with good acidity, Jonagold with a sweet honey flavor, and a Macoun, with a firmer texture. To highlight the vanilla undertone of the pears, I add a vanilla bean and a little lemon zest for acidity. The recipe comes together easily and with few ingredients. Simply peel and core 6 pears and 6 apples and cut into about 1-inch cubes, the smaller the size the shorter the cooking time. To core apples, use a melon baller. The stems of the pear extend down to the core. Quarter the pear and use a paring knife to slice top to bottom to remove inner stem and core. To get to the seeds of the vanilla, make a slit at the end of the bean, but don’t cut through to the bottom. Slide the knife between the pod and run the knife down the bean to split it in half lengthwise. Scrape out the seeds with the edge of a paring knife. Add 1/4 cup cold water, the vanilla bean seeds and the lemon zest. Cover and cook over a very low flame. Low and slow is the way to go – high heat only scorches the fruit and that flavor permeates the entire sauce. Stir every 3 minutes or so to move the fruit on top to the bottom. Once the fruit starts to break down, raise the heat a bit, just a little bit, and leave the cover askew. These are juicy fruits and it’s good to let a little of the liquid evaporate. A loose apple-pear sauce isn’t as tasty or pleasing to the palette. The sauce is usually done in 30 to 40 minutes, again this depends on the size of the fruit. An unripe, extra-firm fruit can also take a little longer to cook. To test, push a few fruit cubes against the side of the pan with a wooden spoon. The sauce is ready when easily smashed. Mash with a potato masher. I like my apple-pear sauce to have a little texture and leave some small chunky pieces. Don’t use a blender, food processor or immersion blender, however, the harsh processing destroys cell structure and the sauce becomes a soup. Cool, place in jars, cover and refrigerate or freeze. Recipe doubles easily and freezes well. Here’s a little twist on traditional applesauce, Apple-Pear Sauce. Use a variety of pears and apples for complex flavor and texture. To get to the seeds of the vanilla, split it in half lengthwise and scrape out the seeds with the sharp edge of a paring knife. Summer brings an abundance of zucchini either from your own garden or the farmers’ market. I found piles of leeks at the farmers’ market at the same time the zucchini reached peak season. As I eyed them, it was like they were screaming at me to make a Leek and Zucchini Casserole! I went a little crazy with this recipe in terms of over-the-top richness, — butter, Parmesan and Cheddar cheeses –but once in a while it’s so nice to sit down to an ooey-gooey mound of deliciousness on your plate. First, let’s address those leeks. They’re sandy and require a thorough cleaning. Remove the dark green tops and the root portion at the bottom of the bulb and discard. Cut the leek in half lengthwise and then into thin slices. Toss into a large bowl of cold water and swish around. Take handfuls of the leeks and gently rub between your palms to separate the layers and loosen the dirt. Let sit for a few seconds so the dirt settles to the bottom of the bowl. Scoop the leeks into a colander. Drain, rinse, and refresh the bowl with cold water, and repeat the cleaning process once more. Drain. I used a mandolin to slice the zucchini into ¼-inch rounds, which is the perfect size for the time and temperature in this recipe. If you cut the zucchini by hand and make thicker slices, or just prefer thicker slices, increase the timing by a few minutes. Herbes de Provence is a lovely blend of Provencal herbs, which complements the delicate taste of this leek and zucchini casserole. I like Penzey’s herbes de Provence which contains rosemary, cracked fennel, thyme, savory, basil, tarragon, dill weed, oregano, lavender, chervil, and marjoram. Or, substitute something earthy like thyme or rosemary, either dried (same amount) or fresh (1 tablespoon, plus 1 ½ teaspoons minced). Zucchini has a high-water content which is expelled during cooking. The only place it has to go is into the casserole and eventually over the sides onto the oven floor. I always recommend placing this style of recipe on a lined baking sheet to catch any drippings. But you can also take a couple of steps to prevent too prevent this. The leeks and cream also contain water, dilute flavor and increase chances of spillage. Don’t skimp on the time suggested in the recipe to saute the leeks, which releases and evaporates the water and intensifies flavor. Same for the cream, cook it down until it’s thick enough to stay in place when stirred. Following these simple instructions yields a delicious, cheesy and less runny leek and zucchini casserole. Let’s get started. Grease a 1-quart casserole dish with a little butter – I use my slightly smaller Le Creuset 24-ounce casserole dish – and preheat the oven to 400 degrees F.
Melt the butter in the oil in a large skillet over medium heat. Add the leeks, garlic, herbes de Provence, salt, and pepper. Stir to coat with the fat and saute for 10 minutes, stirring occasionally. If the leeks begin to brown, reduce the heat a smidge. Add the cream, bring to a boil, reduce the heat to a gentle boil, and cook until the cream is quite thick, about 6 or 7 minutes. When you run a spoon through the cream, it stays in place. Spread ¼ of the cream and leeks on the bottom of the greased casserole dish. Lay ¼ of the zucchini slices on the bottom, overlapping slightly. Repeat layering the cream and leek mixture and the zucchini 3 more times. Strew the shredded Cheddar cheese over the top and bake in preheated oven for 40 minutes. Let sit for 10 minutes to settle before serving. Tip: The casserole can be prepared a day before cooking. Cover and refrigerate. 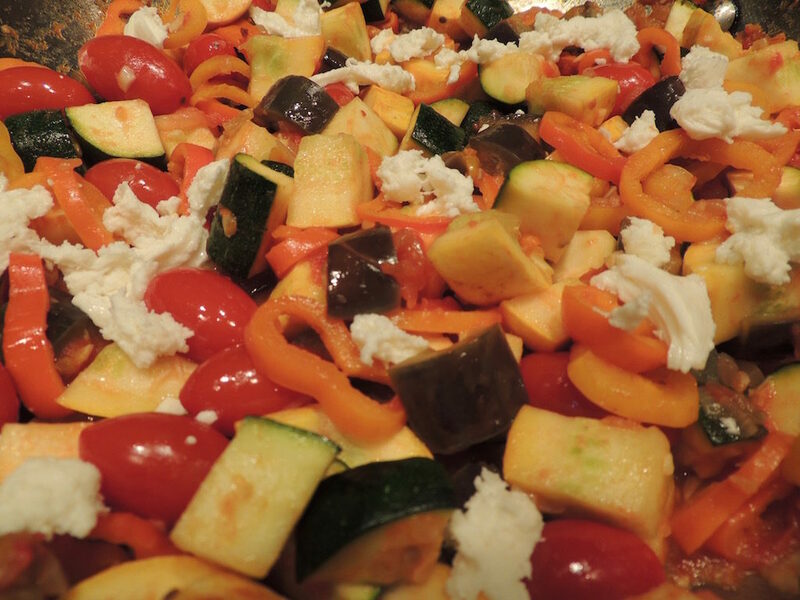 Take out of the refrigerator and place in preheated oven; increase cooking time by 10 minutes. The casserole can be prepared a day before cooking. Cover and refrigerate. Take out of the refrigerator and place in preheated oven; increase cooking time by 10 minutes. Do you get carried away by the beautiful produce at the farmers’ market? It happens to me all time. From one stand to the next there are more and more tantalizing vegetables. Fear not, you can toss them all on the grill and make a medley of Grilled Vegetables! Grilled vegetables are a wonderful side for any meal or a meal in and of themselves. The leftovers make great wrap sandwiches the next day or dice them for a salad. Cooking times vary depending on the whether the vegetable is cooked whole or sliced. I like my eggplant cooked well. I don’t find the taste of undercooked eggplant or its spongy texture appealing. However, a well-cooked, silken eggplant is perfection. Corn takes a couple minutes per side, so 6 – 8 minutes. Cook over high heat for charred corn, which also makes a wonderful chowder. To cook gently, place it on the indirect heat side and cook for the same amount of time. Scallions cook quickly and char easily – keep an eye on them, but it’s well worth grilling them for the sweetness they exude right off the grill. To cook zucchini and summer squash I remove them while they have a little firmness. They contain lots of water and can turn to mush easily. A little texture in the bite is nice. 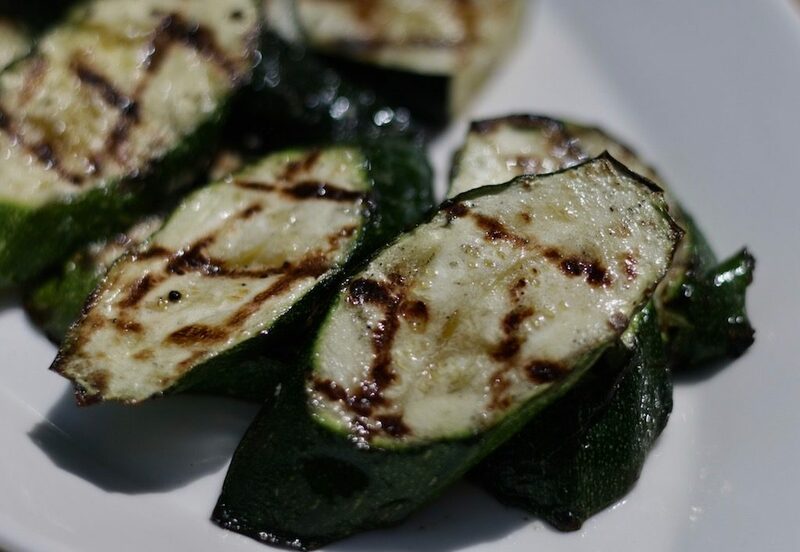 To grill, simply drizzle with olive oil and good sprinkle of salt and pepper. Additional dressings or herbs can be added after cooking. Grill up some thick, bone-in pork chops to go along with your grilled vegetables! Let yourself be tempted – bring those veggies home and grill them up! 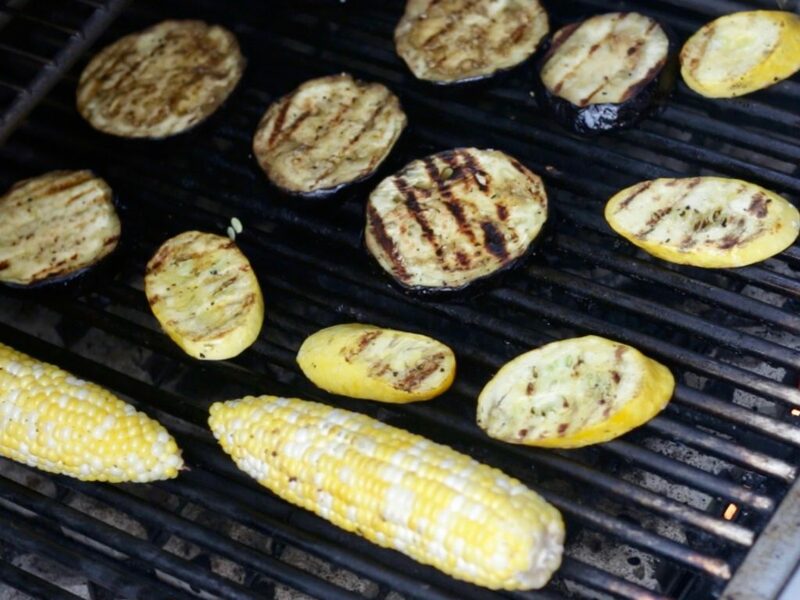 Watch our video on How to Grill Vegetables here. 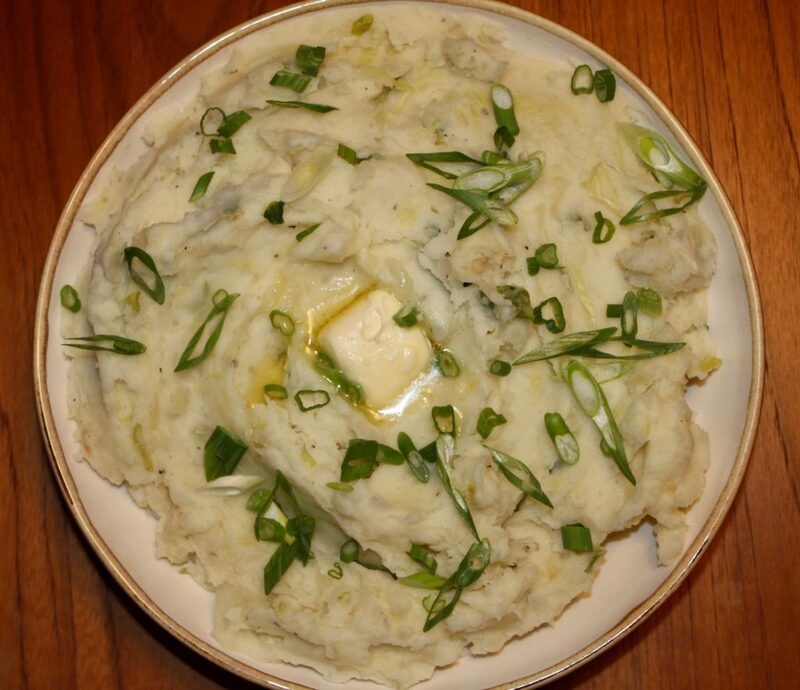 To celebrate St Patrick’s Day, we’re making Colcannon, an Irish potato side dish made with mashed potatoes and cabbage. It’s buttery and tasty! Ironically, the corned beef and cabbage so ubiquitous in the States is not the traditional Irish St. Patrick’s Day dinner. Lamb is enjoyed on this day in Ireland and we have the perfect recipe for you that is delicious with this colcannon recipe: Garlic Rosemary Roasted Boneless Leg of Lamb. Place the potatoes, salt and enough cold water to cover by 2 inches in a large covered saucepan and bring to a boil. As soon as the water boils, lower the heat and tilt the lid to allow some steam to escape and to prevent the potatoes from boiling over. Cook until the potatoes are fork tender, about 20 minutes – timing varies depending on the size of the potatoes. Drain. While the potatoes cook, melt the butter in a large skillet over medium heat. 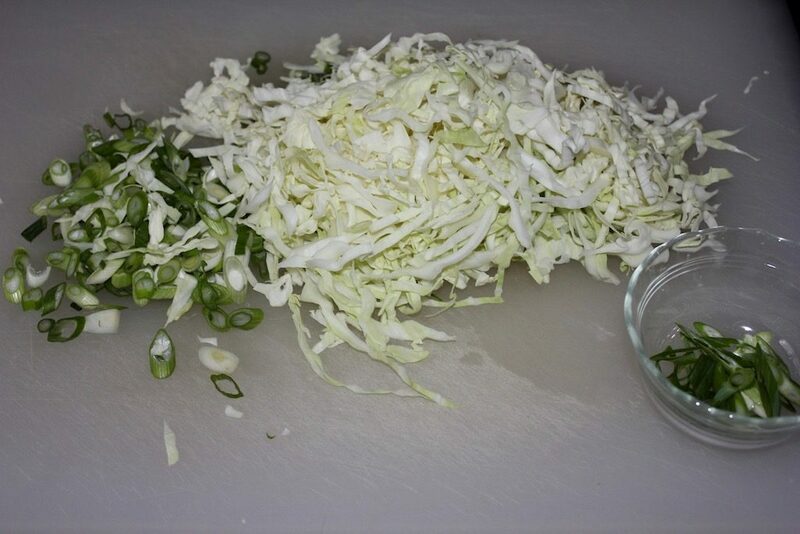 Once the butter foams, add the cabbage, scallions, salt and pepper. 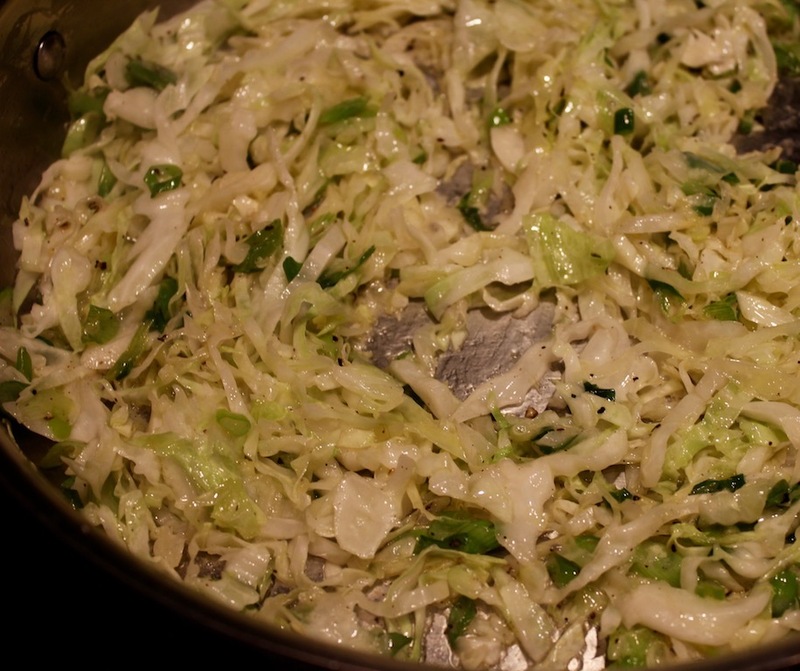 Cook, stirring occasionally until the cabbage expels water and softens, about 3 minutes. Mash the potatoes with the warm milk until smooth. 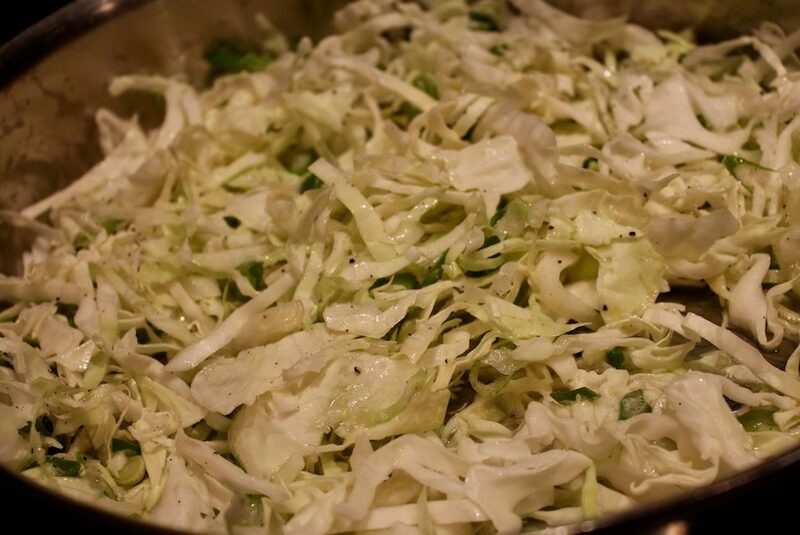 Stir in the cabbage and scallions to combine. Garnish with a couple of twists of the peppermill and the reserved scallion greens. Warm the milk and butter together before adding to the potatoes to keep them hot. I remember serving these Mashed Sweet Potatoes with Goat Cheese for Thanksgiving one year. My Aunt Irene loves sweet potatoes. After dinner, she was complimenting me and I mentioned the goat cheese. She said “oh” and frowned. I never made them that way for her again, even though she loved them until she knew about the goat cheese! I’m not sure when or why it occurred to me to add goat cheese to sweet potatoes, but I find the natural sweetness of the potato a little overwhelming. The tartness of a little goat cheese downplays sweetness in a balanced way. A ratio of 1 pound of sweet potatoes to one ounce of goat cheese works best. 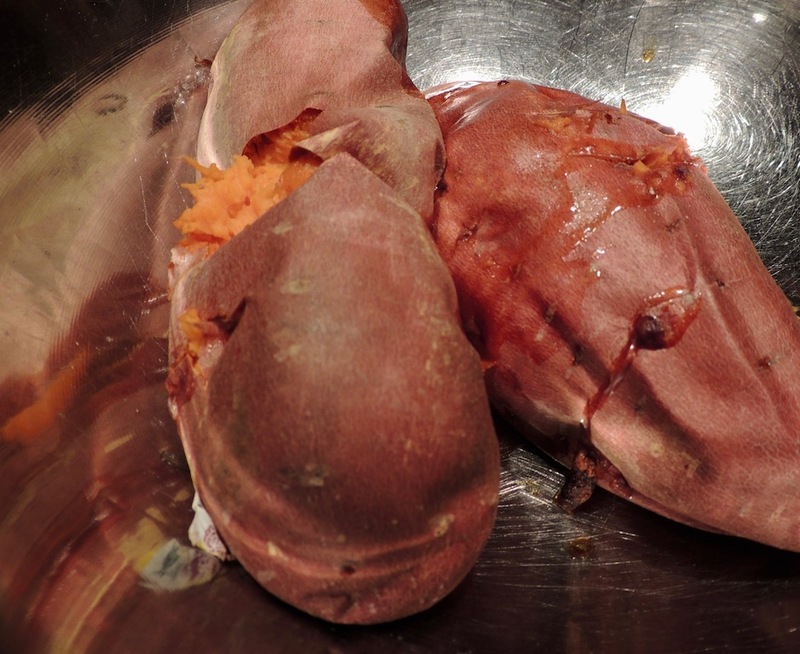 Pierce the sweet potatoes three times with a paring knife to allow the steam to escape. The potato creates its own chimney when the internal water reaches boiling point and the potato pulp bursts through the hole everywhere. These slits allow the steam to escape without the drama. Place aluminum foil on the middle shelf and place the pierced potatoes on the foil in a preheated oven (400 degrees F). The natural sugars become a syrup and leak through the slits and onto the floor of the oven. The foil captures those juices, saving your oven. Bake for about an hour. The potatoes are done when a fork easily slides in. Let sit for 15 minutes to cool for easier handling; peel. 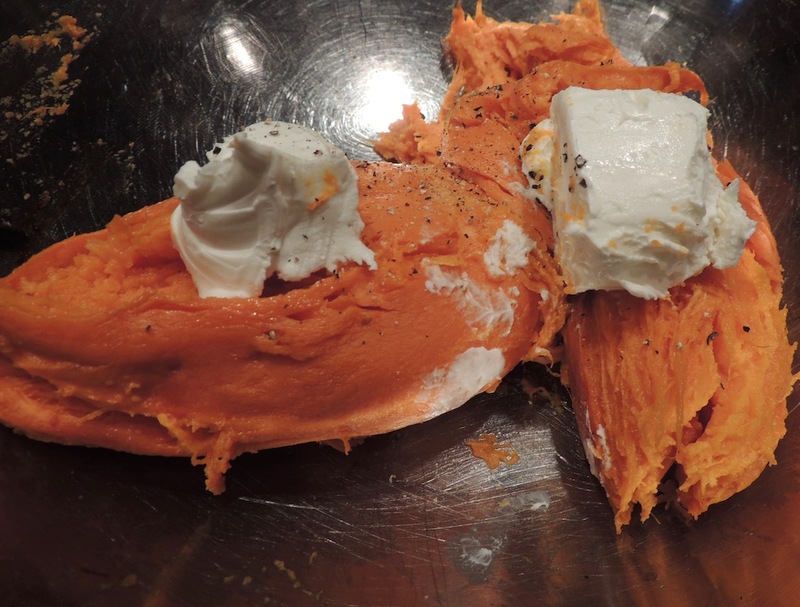 Use a fork to combine the sweet potato, goat cheese, salt and pepper. Pair these sweet potatoes with our grilled lamb chops. The tartness of a little goat cheese plays down that sweetness of the potato in this recipe for Mashed Sweet Potatoes with Goat Cheese. I find a ratio of 1 pound of sweet potatoes to one ounce of goat cheese works best. Pierce the potatoes three times and place in preheated oven on a sheet of aluminum foil. Bake for one hour or until a fork easily slides through the potato. Let sit for 15 minutes to cool for easier handling then peel. The tartness of a little goat cheese downplays the inherent sweetness of the sweet potato. A ratio of 1 pound of sweet potatoes to one ounce of goat cheese works best. Fresh artichokes are delicious but time consuming to prepare. This recipe for roasted artichoke hearts with lemon parmesan vinaigrette works well with frozen artichokes, a quick and easy alternative and thawing is not necessary. Avoid canned or jarred artichokes; they are too soft and don’t hold up well in a cooked recipe. Use as an hors d’oeuvre or first course. Fresh artichokes are delicious, but time consuming to prepare. Frozen artichokes are a quick and easy alternative and thawing is not necessary. Avoid canned or jarred artichokes, which are too soft for additional cooking. To use frozen artichokes, lay on a towel or paper towel and cover with another; press gently to remove excess moisture. Place the artichokes on a baking sheet and add the olive oil, salt and pepper. Toss to combine. Bake in preheated oven for 45 minutes, toss halfway through the cooking time. The artichokes are done when the edges are slightly brown and crispy. 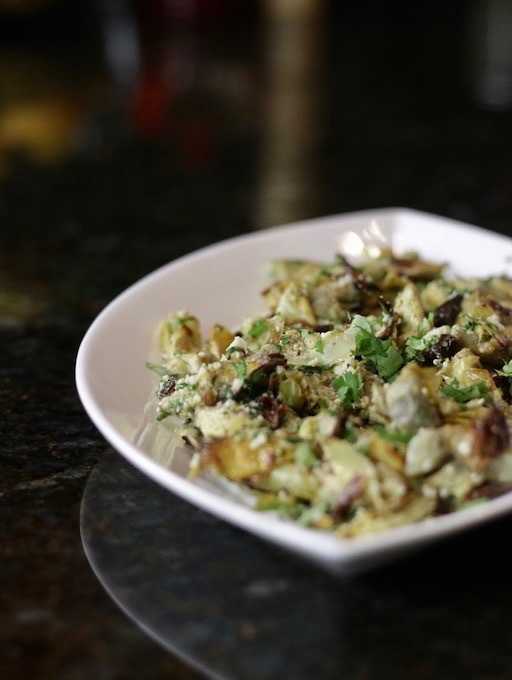 Pour the vinaigrette over the artichokes and toss to combine. Serve on a warm platter or individual plates and garnish with chopped parsley. For the Vinaigrette: Place the oil, cheese, parsley, lemon zest and juice, garlic, mustard, salt and pepper in a jar and shake to combine. Frozen artichokes may several minutes longer than frozen. Cooking onions highlights their inherent sweetness. Making grilled onions does that and adds a lovely charred flavor so distinctive of the grill. It’s a simple thing to make grilled onion rings, but frustrating. No matter how hard you try to keep the onion slice in one piece, it eventually softens and falls apart. Then the onion rings begin to fall through the grate and all is lost. Now I use a vegetable grill tray. Don’t ask why it took so long to get one of these – it changed my life! Slice and separate the onion rings. Toss with a little oil, salt and pepper, and strew the rings over the vegetable grill tray. Place on the hot grill, cover and cook for a couple of minutes. Turn and cook a little more. Keep turning and cooking until you get the desired doneness. I like some to have a little char on them, but still have some texture. These are perfect for fajitas, hamburgers or toss over any grilled meat or vegetable. Watch the Grilled Onion Rings Video Here. 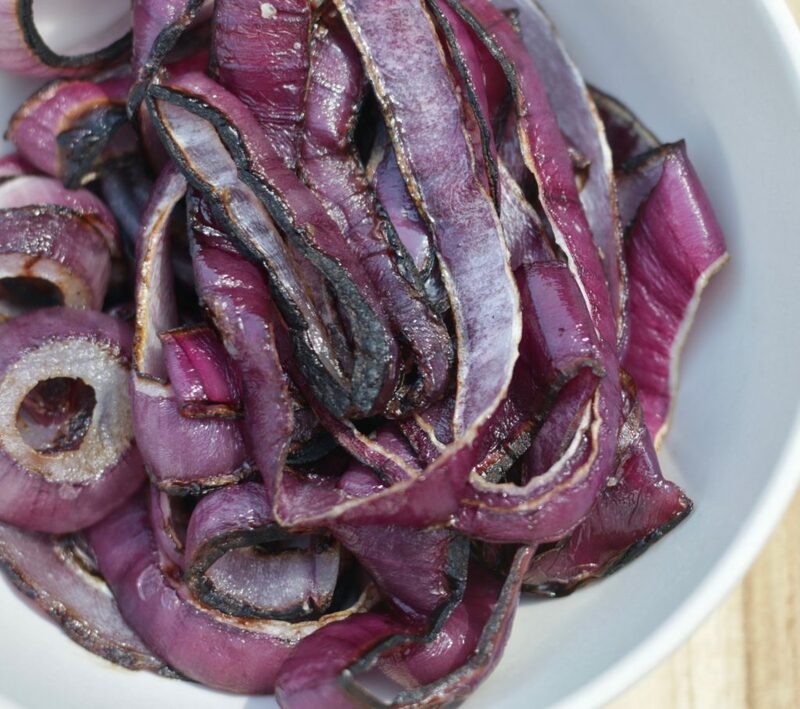 Grilled onions highlight their natural sweetness and add a bit of char to the flavor. Good for fajitas, burgers, sandwiches and salads. Toss the onions with the oil, salt, and pepper. Place on a vegetable grill plate and transfer to the hot grill. Cook for ten minutes, turning occasionally to prevent burning. today another. I overbought (surprise). 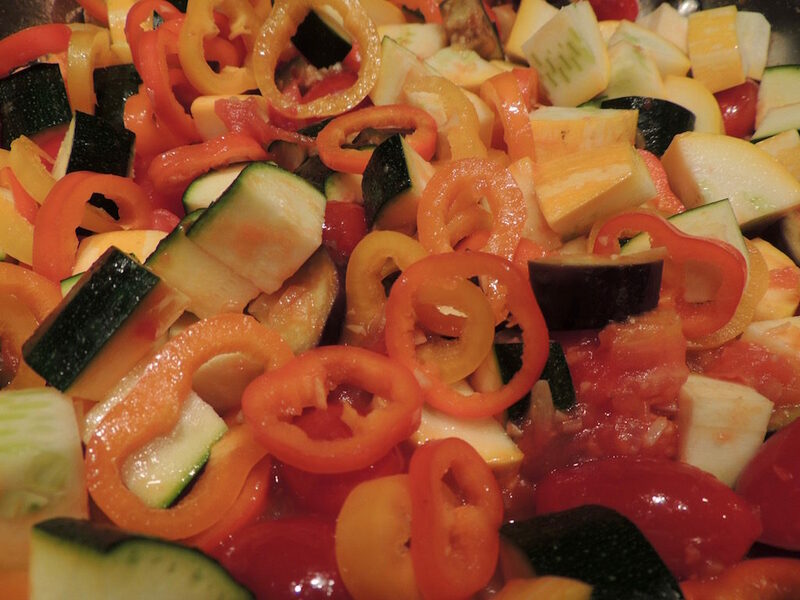 A great way to use a variety is to turn them into Summer Vegetable Medley. 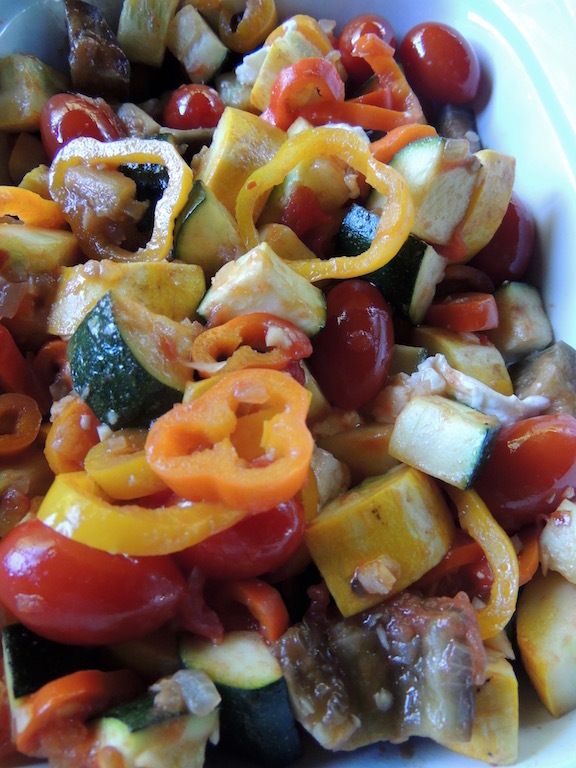 This medley contains Japanese eggplant, zucchini, summer squash, mini bell peppers, cherry tomatoes, onions and garlic. A colorful, eye appealing dish packed with flavor. Have you seen these adorable mini bell peppers yet? I just love them. They’re tender and sweet. 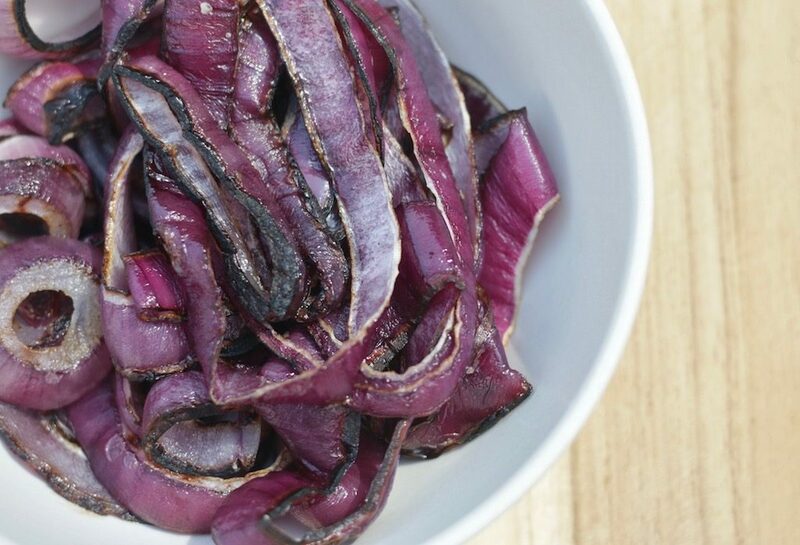 Slice them into rings that look great in salads or our summer vegetable medley. I like eggplant on the soft side and tossed it into the pan after the onions softened and the garlic released is perfume to cook for a while before adding the remaining ingredients. The summer squashes, however, I like with some texture and toss them in later so they are al dente. I had a little bit of fresh mozzarella left in the refrigerator, which I pulled off in little pieces and added just before scooping the vegetable medley into the serving dish. Oops, I forget to use the basil, but we have enough of the vegetable medley left over to serve over pasta tomorrow. I’ll round out the leftover vegetable medley with corn kernels and of course, basil! Aren’t leftovers the best??? Purchase the eggplant and squashes in similar sizes. The easiest way to cut the eggplant and squashes is lengthwise in half and lengthwise in half again. Then in ½-inch slices horizontally. The result is bite-size pieces that are pretty uniform in size and shape. Use other cheeses to garnish, such as goat cheese, Feta or grated parmesan. Use bits of fresh mozzarella, goat cheese, Feta or grated parmesan cheese and chopped basil. Heat the oil in a large saute pan over medium heat. Stir in the onions and cook until soft, 3-4 minutes. Stir in the garlic and cook for 30 seconds, just until the aroma is apparent. Add the eggplant and tomatoes and cook until the eggplant is soft, about 6-7 minutes. Stir in the zucchini, summer squash, bell peppers, salt and pepper flakes. Cook until the squash is still a little firm, al dente. Stir in the basil and top with cheese.